Monet family moved to Le Havre, a Normandy coastal town. There, his father worked as a wholesaler and ship chandler and hoped that his son would do the same. His mother, a singer, was very talented musically. Much to the disappointment of his father, Claude Monet wanted to be an artist from a young age and had no problem announcing it to the world. In Le Havre secondary school of the arts he gained a reputation for his for his charcoal caricatures which he could sell at a local store, Gravier’s, for ten to twenty francs. Gravier told Monet that he could learn much from a man who purchased frames at his shop, Eugene Boudin. Monet did not like Boudin’s work and thus did not think much of the advice. Finally, one day Monet and Boudin were both at the shop at the same time and were introduced. Boudin complimented Monet’s caricatures, but told him that he needed to expand. From 1856-57 Boudin worked with Monet, teaching him things like how to paint “en plein air” (outdoors) and they remained lifelong friends. Monet would later say that Boudin’s help was decisive in his becoming a painter. On January 28 1857, Monet’s beloved mother died. 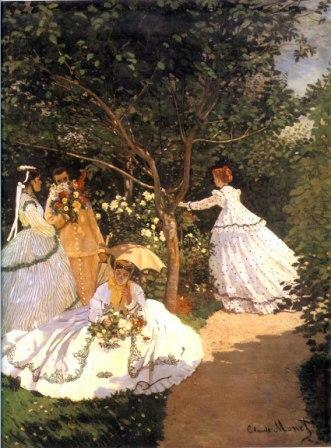 Shortly after, Monet left school and moved in with his childless, widowed aunt. In 1861 he was drafted and sent to Northern Africa. Monet’s father offered to buy him out if he would come home and work in the family business, not inclined to do so Monet joined the army and fought. His aunt pulled some strings and got him sent home when he contracted typhoid, on the condition that he study under a respected artist. That artist was Charles Gleyre.